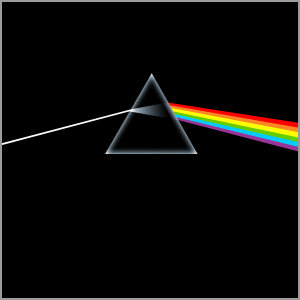 THE DARK SIDE OF THE MOON GUITAR TONES - One of my all time favorite albums is Pink Floyd's Dark Side of the Moon. 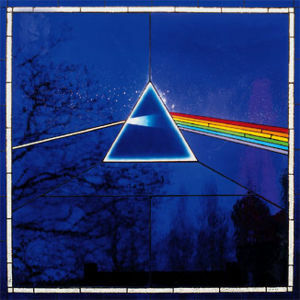 It was recorded in the famous Abbey Road Studios in 1973, and its release in 1973 increased the Floyd's popularity enormously worldwide. It basically put them on the map, and showed the public and the music industry that a "concept" album could be both popular and profitable. It also showed that the music, not the personalities behind it, could sell records. The four individual band members were relatively unknown and faceless at the time. Each was in top form and each wrote and contributed to the writing of what is arguably their greatest work. In some ways, Dark Side is the definitive Pink Floyd album. It combined the best elements of Floyd's previous works into one cohesive piece that showcased each member's talents equally. David's guitar work and tones were incredible, and Roger wrote some of the best songs and lyrics of his career. The mix of David and Rogers' individual voices singing lead on different tracks made for an interesting contrast of vocal styles, with each fitting the respective songs. Richard Wright's keys were both beautiful and haunting, and his voice perfectly harmonized with Davids. Nick Mason's drum work expertly kept it all together, and he and Roger's bass rhythms formed the central back bone of just about every song. Together the Floyd produced one of the finest rock albums in history and it encompassed a very broad range of blues based musical styles, soundscapes, and effects. DSOTM effectively creates a mood, and as you get sucked in from the very first track, it carries you on a musical journey centered around life and the short time each one of us has to live it. As a testament to how popular this album was, and remains to this day, it stayed in the charts for 591 consecutive weeks (over 11 years) on the Billboard top 200 charts, and stayed in the Billboard charts for around 14 years until Billboard changed the way it calculated chart positions. My first exposure to Pink Floyd was hearing the song Time on the radio when I was a child. I absolutely loved this song, from it's enigmatic rototom intro to David's searing guitar solo. At the time, this was the most incredible solo I had ever heard, and it caught my attention every time it came on the radio. No one else sounded quite like David. It was my favorite guitar solo - at least until a little song called Comfortably Numb came along a few years later. Money was also another track played heavily on the radio. That was my second favorite guitar solo. I thought that guy on Money was good, but not quite as good as the guy who played the solo on Time. A short time later I realized it was the same band! Almost every other track on the record received airplay on the various radio stations I listened to as a kid, but it was not until I got my first job as a teenager and started buying albums that I was able to listen to the piece as a whole. That first time listening to Dark Side from beginning to end was a very moving experience, and listening to it today I still have the same feeling I had that first time through. David Gilmour's guitar playing and tones reached a new level with this record. His mix of modulated clean tones, echo drenched slide guitar, and screaming fuzz leads seemed to fit every song like a glove. The unique tones really stood out above other guitarists at the time, and still stand out today. For most of the distortion/fuzz tones and overdrive tones on the album David used the Dallas Arbiter Fuzz Face, with BC108 Silicon transistors rather than NKT275 Germaniums used on earlier Fuzz Faces, and a Colorsound Power Boost. Those were both in his pedal board at the time. Both the Fuzz Face and Power Boost were used on the previous Obscured By Clouds album, and the pre and post DSOTM tours as well. A very simple setup, but not very easy tones to capture unless you have a tube amplifier capable of very loud volume without breakup or amp generated distortion. The key to these tones is to let the pedal's sound do the work, and the amp to be the vehicle to deliver the sound with only minimal amp breakup adding to the distortion. The amp needs to be right on the edge of feedback in order to react with the Fuzz Face and Colorsound correctly. It is known that David had a Fender Twin Reverb siverface 100w amp, his trusty Hiwatt DR103 100w amp heads, and WEM Super Starfinder cabinets with Fane Crescendo speakers at the time, but what was actually used in the studio is unknown. These are two very good amplifiers that are very loud, yet very clean sounding with lots of head room. Engineer Alan Parsons has stated that he only remembers David using Hiwatt heads and cabs in the studio. When asked what he used in a 1993 Guitar World interview David said, "I imagine it was a Hiwatt, but I'm not too certain. I used Fender Twin Reverbs in the studio a lot, too". Overall I get best results matching these tones with my Fender Twin Reverb. Some sources say David used an Orange Treble & Bass booster for the DSOTM fuzz tones. Orange was a small company making effect pedals in the early 1970s, but there is no evidence that they ever made a treble & bass booster, and this myth appears to be a misunderstanding of something David's gear tech, Phil Taylor, said in an interview. Phil was quoted saying David used an "orange treble and bass booster". 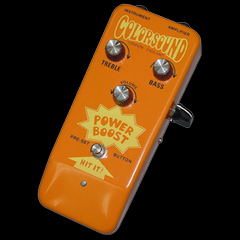 This was actually a literal description of the Colorsound Power Boost , which was a bright orange colored booster pedal, featuring treble and bass knobs! Two other key ingredients to the DSOTM guitar tones were modulation and echo delay. For modulation David used a Univox Uni-Vibe and rotating speaker cabinets. David also had a EMS Synthi Hi Fli effect processor, which creates phase, ring modulation, and other effects. I believe it was used on Any Colour You Like, although a Uni-Vibe also gives a similar effect. For delay David used Binson Echorec analog tape delays, which were capable of delay times around 300-340ms, although there are longer delays featured on the album that were created in the mixing stage. The Uni-Vibe was actually invented to simulate a Leslie type rotating speaker cabinet. David had a Leslie, but for Dark Side he also had a Maestro Rover rotating speaker cabinet, which I believe was used for the clean tones on many songs. His Hiwatt DR103 amps mentioned above were also on hand, as well as several other amps, likely the Fender Twin Reverb. It's a pretty basic setup, but not easy to get those exact modulated clean tones you hear on the studio album. For that modulation you hear in "Breathe" and "Us and Them" I believe David may have used both the rotating speaker cabinet and the Uni-Vibe at the same time. 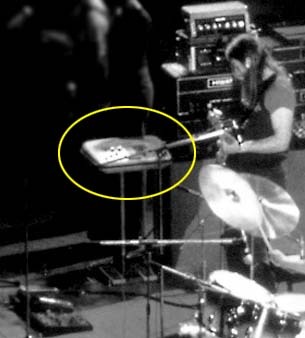 Track sheet notes from the recording sessions seem to indicate both were used, and both were seen in his gear in the 1973 tour. Even though the Uni-Vibe was designed to replicate the sound of a rotating speaker, it had a unique sound separate from the Maestro and Leslie. For guitars, David used a 1969 Fender Stratocaster (the famed Black Strat) with a 1963 rosewood neck, a 1970 Bill Lewis 24 fret custom guitar (used on the Money solo, and other tracks), and possibly a Fender 1000 pedal steel slide guitar that David acquired in 1968 at a pawn shop in Seattle, Washington. David thinks he used the pedal steel in the Dark Side sessions and has commented that he never used the pedals on it. Roger Waters' recollection is that David actually used a Strat on his lap to play the slide parts in the studio for DSOTM. David is seen doing this a few years earlier in the Pink Floyd Live at Pompeii film. 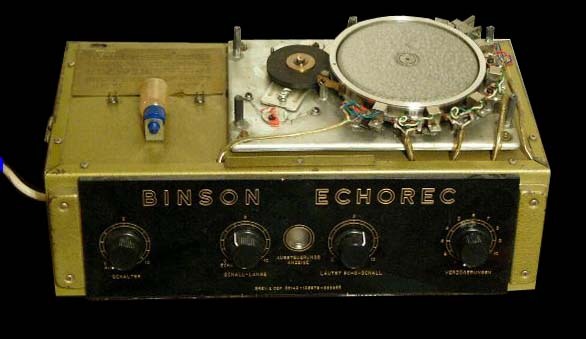 Vintage Binson Echorec II. Right photo shows the top removed from the Echorec to display the recorder tape drum and tape heads. The Binson delay time averaged around 310ms, but there are longer dleays on DSOTM that were created in the mixing stage. SOUND CLIPS - Below are some isolated sound clips for each song on Dark Side of the Moon, and my recommended gear and settings for each. 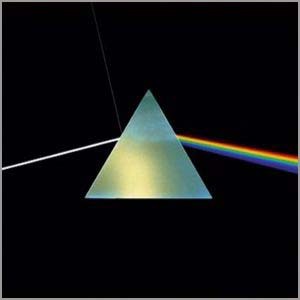 Clips are ripped from the incredible 5.1 stereo mix of Dark Side of the Moon mixed by James Guthrie and released in 2003 (thirty years after the original release) and the quad mix created by Alan Parsons. I highly recommend you buy the 5.1 mix if you have a surround sound system. I have isolated the guitar tones from the surround tracks as best I could so that you can hear David's tones clearly to try and match them with you own gear, and so you can hear exactly what he is playing for learning reference. I also suggest anyone interested in Pink Floyd buy and study the original album. It should be in everyone's music library. The guitar solos on Time and Money are classics, but EVERY song on this record is superb. SOUND EFFECTS - I have also included some of the sound effects and voices from the album. EMI had a vast sound effects tape library and a master sound effect catalog at Abbey Road that they encouraged bands to use. Many of these sound effects appear on sound effects records to this day. 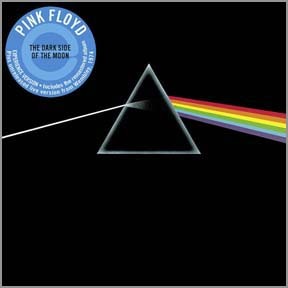 Pink Floyd had been using the library for several years (The Beatles were also big users) but they were also beginning to create their own sound effects by the time of Dark Side of the Moon. When Alan Parsons started at Abbey Road as a staff engineer, part of his job was to record new sound effects for the EMI library. He was still doing this at the time he was assigned to Pink Floyd as recording engineer for DSOTM, resulting in his suggesting the clock sound effects for Time. SPOKEN WORDS - There are soundclips of the spoken words used throughout the alnum below. This section explains how those came about and who the speakers are. This is a mix of sound effects, voices, and a reverse guitar swell. Credited to Nick Mason, but this was actually assembled and mixed by Roger Waters. MP3 Sound Clip - Isolated sound effects and reverse guitar swell. Rhythm guitar - Light drive from Colorsound Power Boost/Overdriver, Skreddy Lunar Module, Boss BD-2, or similar overdrive pedal. 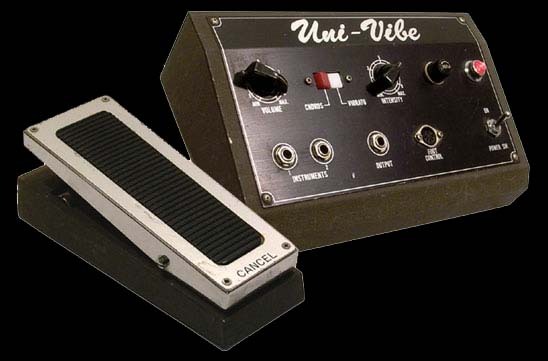 Modulation from Uni-Vibe, similar vibe pedal, or rotary speaker cabinet simulator pedal like the Boss RT-20. Slide Guitar - clean tone, finger picked, with long and short delays created in the mix. One delay is 440ms, and a longer delay is 920-930ms. MP3 Sound Clip - Guitar and slide guitar. MP3 Sound Clip - Pedal steel slide guitar only. MP3 Sound Clip - Guitars in front of mix. Rhythm guitar with Uni-Vibe and rotating speaker is louder in the track. No vocals or drums. MP3 Sound Clip - Guitars in front of mix with reverb and delay. Rhythm guitar with Uni-Vibe and/or rotating speaker is weaker in the track. No vocals or drums. MP3 Sound Clip - Backing track to play guitar along with. Created from 5.1 surround mix. Pre-release live "Traveling Sequence" version. Guitar - Colorsound Power Boost/Overdriver, Skreddy Lunar Module, Boss BD-2, or similar overdrive pedal. Modulation from a Uni-Vibe, Boss RT-20, or similar vibe pedal. Analog type delay. 310ms, with 3-4 repeats. Played in Em. This sound is even better when using a compressor and a light drive, or simply two compressors stacked and no overdrive, along with a vibe. MP3 Sound Clip - Sound effects and spoken words from the isolated DVD-A channels. MP3 Sound Clip - "Live for today, gone tomorrow. That's me" dilaogue by Roger "The Hat" Manifold. MP3 Sound Clip - Roger "The Hat" Manifold's mad laughter. MP3 Sound Clip - Here is a 1972 live version of On the Run/Travel Sequence, featuring David on guitar, rather than the familiar synthesized music we hear on the studio version. In 1972 live pre-release concerts there was no synth sequence part. David Gilmour played a guitar section here in almost the same tempo as the later album version. The guitar version was known as the "Travel Sequence". He played in time with a 310ms delay. After the album was recorded, Pink Floyd recorded a very different, funky, studio version that was never used. MP3 Sound Clip - Backing track to play along with the 1972 live version. MP3 Sound Clip - There was very little, if any guitar in the final studio version, though in certain sections something that sounds like distorted guitar feedback can be heard. This piece was created mostly with tape effects and an 8 note sequence looped and sped up using the EMS Synthi A synthesizer. I have removed most of the Synthi A rhythm from the 5.1 surround version so you can play along with it using a guitar. Set a delay for 380 ms, 7-8 repeats, to add ambient delay and swell effects. MP3 Sound Clip - Sound effects from left surround channel. Airport announcer and footsteps can be heard isolated. MP3 Sound Clip - Sound effects from left surround channel. Spoken words and laughter are reatively isolated. 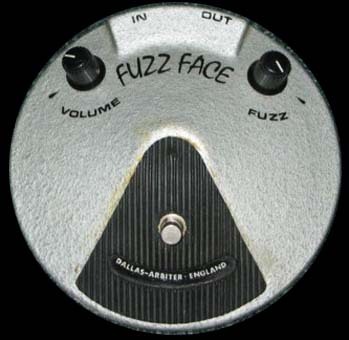 Rhythm Guitar - Fuzz Face or similar fuzz pedal. Guitar Solo - Fuzz Face or similar fuzz pedal, mixed with Colorsound Power Boost/Overdriver, and delay. MP3 Sound Clip - Isolated Clock sound effects. MP3 Sound Clip - Rhythm guitar up front in mix. You can clearly hear every note David plays. No drums. Some vocals and keys. MP3 Sound Clip - Guitar solo highs mixed up front and other instruments toned down. MP3 Sound Clip - Guitar solo lows mixed up front and other instruments toned down. MP3 Sound Clip - Backing track to play guitar along with. Created from the 5.1 surround mix and another backing track with no solo. MP3 Sound Clip - "I am not frightened of Dying" dialogue spoken by Gerry O'Driscoll, the doorman at Abbey Road Studios. MP3 Sound Clip - "I never said I was frightened of Dying" dialogue spoken by Puddie Watts, wife of Pink Floyd road manager Peter Watts (father of actress Naomi Watts). MP3 Sound Clip - Great Gig slide guitar breakdown - both guitars, then left guitar, then right guitar, no delay. MP3 Sound Clip - "In the Right", "I don't know, I was really drunk at the time", "fader eleven" - various snippets of dialogue from the end of the song. Response to the questions "Have you ever been in a fight," and "Were you in the right/" posed by Roger Waters to the interview subjects. MP3 Sound Clip - Isolated Money intro sound effects loop assembled by Alan Parsons, based one Roger Waters original tape effects loop. MP3 Sound Clip - Guitar Solos - guitars 1 and 2 only - with echo and reverb. MP3 Sound Clip - Guitar Solos - dry solo guitar #1 - with drums. MP3 Sound Clip - Guitar Solos - guitar #2 - with echo, reverb, and drums. MP3 Sound Clip - Rhythm guitar mixed up front, other instruments and vocals diminished. MP3 Sound Clip - Rhythm guitar mixed up front with all other instrument tracks and vocals. If you like to play the bass melody on guitar, use this BT. MP3 Sound Clip - Backing track #1 to play guitar along with. Pro track. Not mixed from 5.1 sorround tracks. MP3 Sound Clip - Backing track #2 to play guitar along with. Pro track. Not mixed from the 5.1 surround tracks. MP3 Sound Clip - "Short, Sharp, Shock" dialogue spoken by Roger "The Hat" Manifold, Pink Floyd's road manager. MP3 Sound Clip - Guitar with rotating speaker and/or Uni-Vibe effect mixed up front. You can clearly hear every note David plays. No lead vocals. Other instruments are diminished. MP3 Sound Clip - Keyboards only. Other instruments are diminished. No lead vocals. Nice track to strum along to. MP3 Sound Clip - Backing track to play guitar along with. Mixed from the 5.1 surround tracks. MP3 Sound Clip - The solo guitar section with the guitar mixed up front from two of the surround channels. 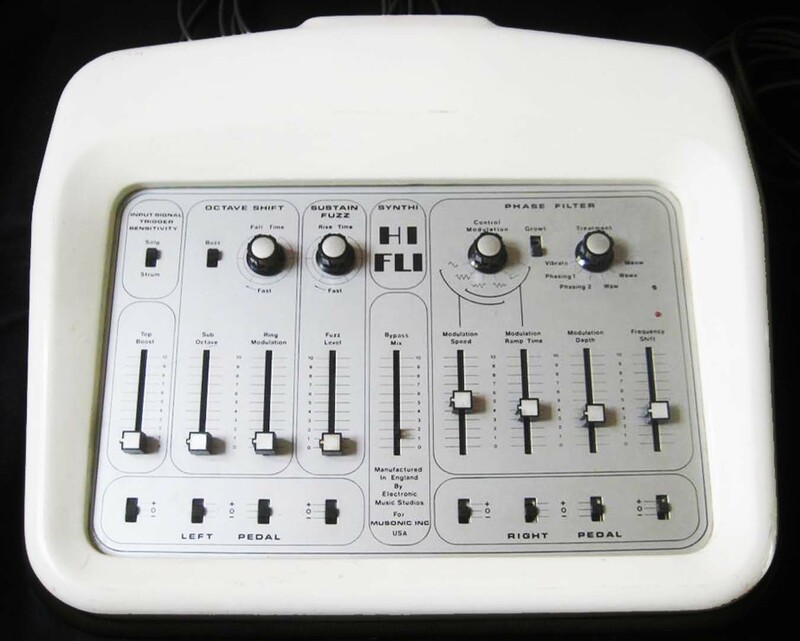 The guitar with EMS Synthi Hi Fli effect processor vibe effect pans through three of the five channels constantly, so it drops out in places. MP3 Sound Clip - The solo guitar section with the reverb guitar and keyboard channels only. MP3 Sound Clip - "I can't think of anything to say" dialogue, partially isolated. MP3 Sound Clip - Laughter audio, partially isolated. MP3 Sound Clip - Guitars mixed up front, other instruments, and vocals diminished. The mad laughter in the background comes from Pink Floyd's road manager Peter Watts (father of actress Naomi Watts). 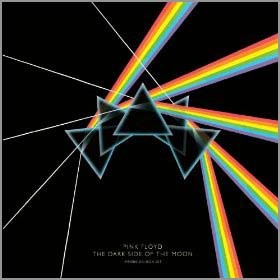 MP3 Sound Clip - "There is no Dark Side of the Moon" dialogue spoken by Gerry O'Driscoll, the doorman at Abbey Road Studios.